One of the surprising events on Hawaii Island is the annual Cherry Blossom Heritage Festival held in the town of Waimea. Waimea sits at an altitude of 2677 feet above sea level in the interior of the island. 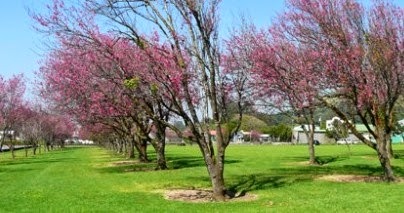 Instead of palm trees, Waimea residents planted cherry trees that bloom in the town’s cool winters. The town has a Cherry Blossom Festival to celebrate the Japanese tradition of viewing cherry blossoms - hanami. The 2015 festival is being held on Saturday, February 7 from 9 AM to 3 PM. The festival activities are held throughout Waimea; pink banners identify the locations from the Parker Ranch Historic Homes on Mamalahoa Highway 190 to the Hawaiian Homestead Farmer’s Market on Highway 19. The festival will have Japanese and multi-cultural performing arts including demonstrations of Japanese cooking, a Bonsai exhibit, Origami demonstrations, Taiko Drums, a Bon Dance, a traditional tea ceremony, and mochi pounding. The festival also includes a Quilt show, Farmer’s Market, Cherry Blossom Art show, entertainment, and a History of Cherry Trees Exhibit. Free shuttle transportation will be provided between most venues. If you are on Hawaii Island in early February, you may want to consider this unusual festival held in the interior of the island.